Antique pocket watches are beautiful collectors’ items, and when properly maintained continue to serve as sophisticated and elegant timepieces with excellent performance capabilities even today. Original fusee movements are a delight for any collector, as are verge pocket watches, even with their requirement for periodic small adjustments. Nothing is more charming to a pocket watch collector than the beautiful sound of a repeater mechanism. It really is like music to the ears. Owners of antique pocket watches will understand how extraordinary it is to hold on to a magnificent piece of history with an impressive past. While American Waltham, and Swiss pocket watches are a privilege to own, nothing could be more valuable to a collector than a rare and fine British antique find. Antique pocket watches require dedicated and precise care and maintenance. There is something very special about preserving a little piece of history and nothing says that more than an antique military pocket watch, an antique railroad watch, or a fine Benson pocket watch, amongst the oldest made by a British watchmaker. At W.E. Clark we are passionate about the preservation of antique pocket watches. Antique pocket watch repair is our specialty. We are one of the few jewellers in the UK to have our very own Master Watchmaker. Whether you are an avid collector of antique pocket watches, or you have inherited an antique timepiece that needs some attention, you will want to make sure your pocket watch is expertly repaired and maintained for it to hold its value. Our Master Watchmaker has extensive experience in valuing, repairing, restoring and refurbishing any antique pocket watch. Everything from key-wind and key-set movements to stem-wind and lever-set movements come into our workshop for repair. Our Master Watchmaker is an expert at disassembling the intricate parts, correcting positional errors, and cleaning and replacing parts suffering from wear and tear. With our expert repair service, you can have your antique pocket watch looking and working like new again. Our Master Watchmaker is gifted in the skills required for perfect case refurbishment. 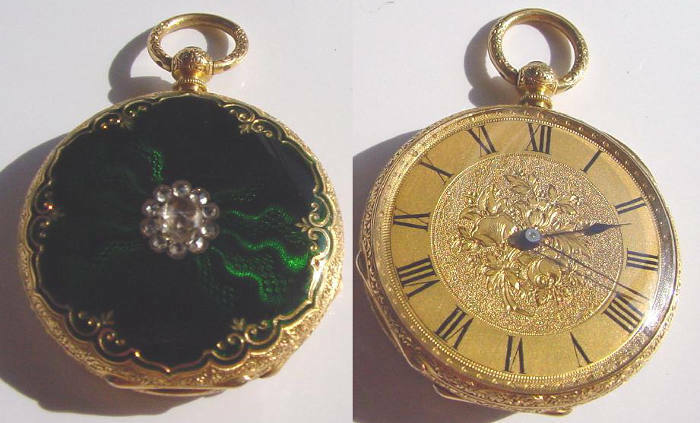 We can restore and refurbish the case of any Hunter, half-Hunter or open-face pocket watch. We are also delighted to be working with one of the UK’s best dial restorers, so every aspect of your antique pocket watch really can be restored to its former glory. The repair and restoration of antique timepieces requires a delicate hand and many years of experience and expertise. Our Master Watchmaker is an antique pocket watch expert and not only understands the intricate workings of all pocket watch styles, he is able to make replacement parts where originals can no longer be sourced. We value the service we give to our customers and we were delighted to be voted regional Independent Retailer of the Year 2017. We also won Best Independent Fine Jeweller in the UK at this year’s Professional Jeweller Awards. With us, your antique pocket watch is in safe hands. We will take care of your antique pocket watch from start to finish. Our Master Watchmaker will carry out repairs and restoration work with the utmost sensitivity and expertise. We are absolutely confident you will be delighted with the results, but for peace of mind we offer a minimum 12 month guarantee for all work undertaken. You can ship your timepiece to us from anywhere in the UK using our Royal Mail Special Delivery FREEPOST service. Your antique pocket watch is insured for up to £20,000 throughout its postal journey, from the moment the package leaves your hand to when it is posted back to you. Before we commence any work, we will discuss any repairs and costs with you first. At W.E. Clark Watch Repairs, your antique pocket watch couldn’t be in safer hands. We would love to repair any antique pocket watch from around the world. Outside of the UK you will have to organise shipping, other than that you can expect the same exceptional antique pocket watch repair service. Feel free to bring your antique pocket watch into our Lewes or Uckfield showrooms. We would love to meet you and discuss your antique pocket watch repair requirements with you.